So the foot is getting much better. I'm able to put it down now and actually walk on it. Yay! Just in time to clean the house make some pies and the lasagna! ;) I'm happy because I really didn't want to have to order out for xmas dinner! I was able to hobble on down to the basement and scrap last night too! I made a Junkitz Box Book of Bear for Michael for Christmas. It's very simple as I wanted to get it done and because he's not much for fluff! I hope he likes it. It's not my best work as it's kind of rushed but it came out OK. I'm going to upload photos to my 123-Scrap gallery later if you want to see it! The "talk" isnt as hard as you'd think. I HIGHLY recommend that your CH have the first talk but then you follow up with a MOM chat. It ensures that all bases (no pun intended!) are covered!! that canvas is so cool! What a sweet sneaky friend! I LOVE the canvas! What a GREAT gift!! Glad to hear that your foot is feeling better!! I am SO glad your foot is improving. Don't overdo it or you'll end up all sore and gimpy again! I'm so glad you like the canvas! It was the first one I'd ever done and I was a bit nervous. I just dove right in!! 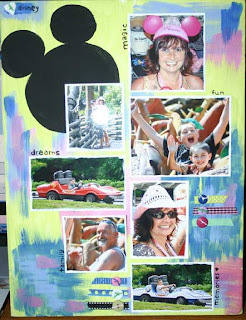 Paint, pictures, ribbon and buttons. That's the list of ingredients. I think I may make one or two for around the house here too. So glad your leg is feeling better! I hope you have a wonderful Christmas!